Jiu-jitsu.News: There are no limits on the way to a healthy lifestyle! There are no limits on the way to a healthy lifestyle! First of all, story of the SC “SKIF” (Ukraine, Kherson) foundation will be useful to people who have some doubts about sport. If you think that it’s too late to go in for sports, your health is not in great condition or you have some other reasons to give up on sport just read this article. “I was 42 years old at the time. Football was the only sport I was engaged in and it was only in school days. But to be honest, after finishing school I had no enough time to go in for sport. It’s quite a usual common story. My life was full of everyday cares, problems and I devoted all my time to family and work. I smoked two packs of cigarettes every day and my weight was 85 kg with the height 168 sm. I became so fat and helpless that my wife helped me to tie shoelaces. On top of all I had shortness of breath and high blood pressure. So I was like a disabled person. I have not heard about Brazilian Jiu-Jitsu before. It was absolutely new kind of sport for me. As time had been going by, one day I felt it’s the right moment for changes. First of all, I gave up smoking. Then I began with a simple running. Later I decided to visit the mixed martial arts section together with my son. Even though the club was focused on Sambo, there were also other types of combat sport classes, including BJJ. Soon I felt that I was interested in the BJJ very much. And in 2015 I rent a small basement and we have started to train there alone. We took techniques from the internet, watched video tutorials, and then we discussed them, studied and trained. 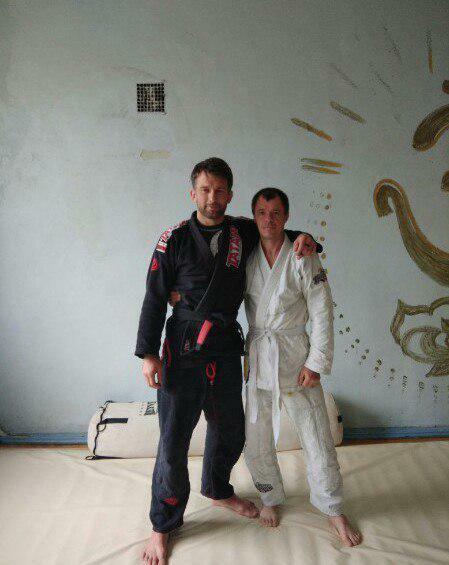 Step by step, people who wanted to be engaged in BJJ started to join us and our club. It must be noted that there were only mixed martial arts in Kherson city and thus we became the first BJJ section in our city. Step by step we started to move forward. Moreover, we attended different seminars and trainings of well-known masters. I also would like to thank people who influence on me greatly and helped very much – these are Ivan Dibrov – purple belt holder (Skadovsk), Artem Golovko – blue belt holder (Kherson MMA club) and Ievgen Tiutiun – blue belt (Nikolaev). Sport club “SKIF” is rather young but we can already boast of some success: prize places on “Kiev Open 2016 NO-GI”, open regional and Ukrainian championships.